"The Kuhl Revolvr pant is our lightweight Uberkuhl technical fabric travel jean. By blending 26% nylon into the ultralight 5.1 oz sq. yd. 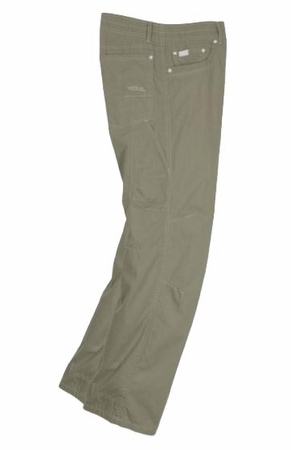 combed cotton canvas we give you the lightweight comfort and breathability of cotton with the added durability of nylon. Scuff-guards. Kuhl's signature technical features for improved Athletik Fit: Free Ryde Waist, articulated knees and a gusseted crotch - for true freedom of movement! Our patina dye and river wash create a great vintage appearance. Scuff-guards: double layer scuff-guard at cuffs and pockets for uber durability. Athletik Fit: designed to accommodate an athletes larger thighs. Fiochi snap imported from Italy"